Verizon About to Turn the Rezound, DROID 4 and RAZR Into Global Devices? Back at CES, Verizon told us that select 4G LTE devices like the LG Spectrum and DROID 4 would eventually become “global” phones thanks to international radios embedded deep inside. According to our sources, there may be more than just those two devices and the change to make them global could be happening very soon. 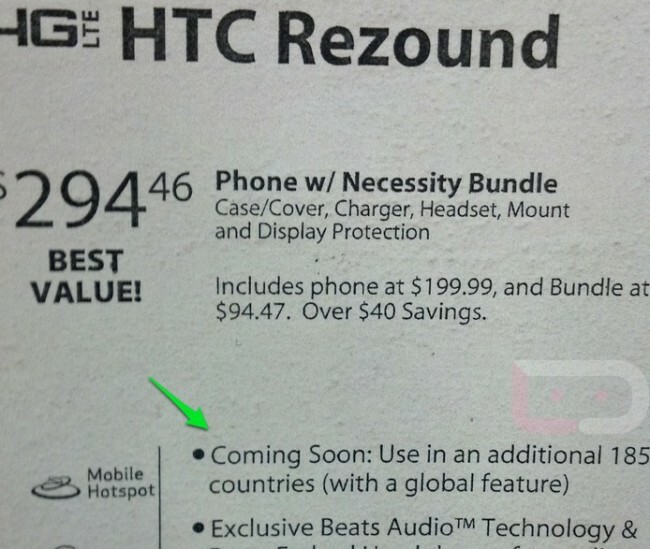 As you can see in the info sheet for the HTC Rezound that is on display, it has a new “global feature” on the way that will give it access to use in an additional 185 countries. They aren’t stopping there though, as stores are being told to print out new info sheets for the RAZR and DROID 4 as well that include similar notes for global features. Your LTE smartphone will soon be a world traveler.